CHI, a community of procrastinators? | Christoph Bartneck, Ph.D.
Home » Culture » CHI, a community of procrastinators? CHI, a community of procrastinators? I just visited the Precision Conference website for SIGCHI and it shows the number of logins for the last couple of days. 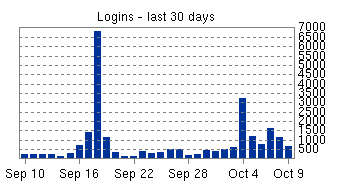 It is amazing how dramatically it spiked on the day of the submission deadline. The CHI community seems to be filled with deadline junkies. For a community that is interested in improving the human experience, we cannot be proud of ourselves.